Welcome to another Pinterest Challenge Blog Hop, hosted by My Pinterventures. The purpose of this Pinterest Challenge is to motivate all the participants of this hop (and you, too) to not just pin, but to make it happen! This month, I chose to make, bake and eat cheesy corn dip. I’m sure you remember how my Prince loves a good (and even not so good) hamburger. His favorite food ever. McD’s is casual dining in his book. And Wendy’s eat-in constitutes fine dining. Saturdays, PC often treats himself to a burger after his baseball game. If we don’t go out for Mexican with the baseball gang, that is. Sundays, I usually grill. Often hamburgers. So, I am always looking for something different to pair with this dietary staple. 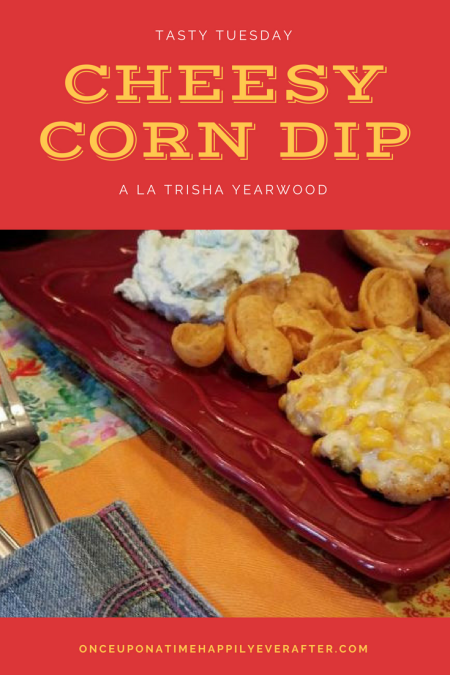 Today it was cheesy corn dip a la country singer Trisha Yearwood. 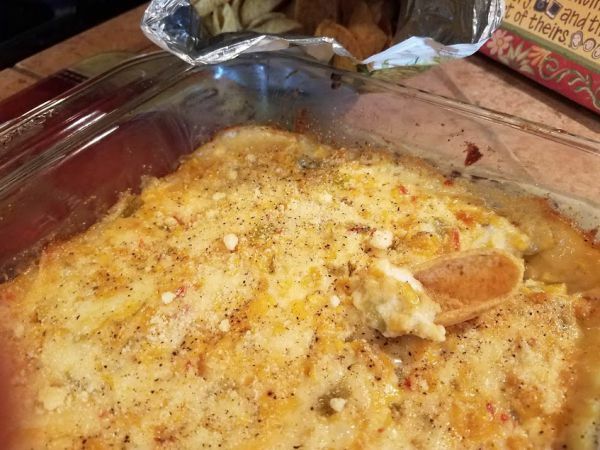 Three years ago, I found this dip on Pinterest and made it for our whole family when we vacationed together at cabins in New Braunfels, Texas. Had forgotten all about it until last week when my sister asked if I could recommend a good dip recipe for her Bunco game night. It was a hit with her friends, too. Decided it would be the perfect thing to pair with our hamburgers today. And best of all, it can do double duty and serve as a veggie, too. Grab your cheese grater and meet me in the kitchen. According to the Pinterest pin this recipe originated with Trisha Yearwood, the country singer. Who seems to be quite the cook. Mrs. Garth Brooks has written 2 cookbooks and has oodles of her home-cooking recipes on Pinterest. Cheesy corn dip is easy and quick so that makes it a winner in my book. And bonus: it’s one way I can get some veggies into my Prince. Plus you probably already have all of the ingredients in your pantry. The recipe doesn’t call for any unheard of spice or seasoning. Take a look. Because I was just making this for the 2 of us, I divided the recipe in half. Then promptly (but accidentally) poured half the can of the chiles in the sink when trying to drain them. But PC’s sensitive tummy was grateful. I think this would be delish with some crushed Ritz crackers mixed with melted butter drizzled on top. In fact, I may have done just that when I made it at 3 years ago. Remembering that it added a little crunch. Spray a 9 × 13 × 2-inch casserole dish with cooking spray ( I used an 8 x 8-inch dish). In a medium bowl, mix the corn, chiles, cheeses, and mayonnaise until fully combined (I mixed the whole kit and caboodle in my casserole dish, one less thing to wash). Oh, and I sprinkled in a little onion powder. Spread the mixture in the prepared dish (unless you were lazy like me and mixed it in your dish). Sprinkle a little extra Parmesan cheese on top (or add the Ritz cracker-butter crumble). Bake, uncovered, for 30 to 40 minutes, or until bubbly around the edges. Serve the dip warm from the oven with corn chips. And a hamburger, of course. You guys know how much I love my crock pot, right? So much it sleeps with us. But don’t let that get out. PC is a little sensitive about sharing our bed with an appliance. 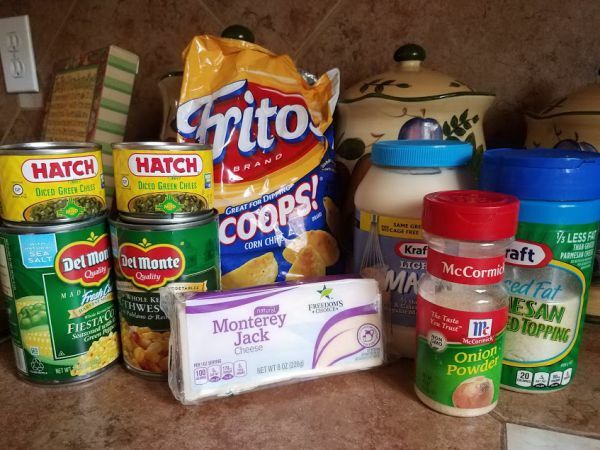 Found this version of the cheesy corn dip recipe that can be made in the crock pot. Put the dip together in the morning, throw burgers on the grill when you get home and dinner is served. Do you have a favorite dip recipe to share? Please add it in a comment below or just share the link to your pin if you have saved it on Pinterest. I would be much obliged to have you follow me on Pinterest, too. Just click here to do so. My sister tagged me on a FB fruit dip recipe. Let me see if I can find it…yup, here it is, only I changed it up a bit. Of course, I did. 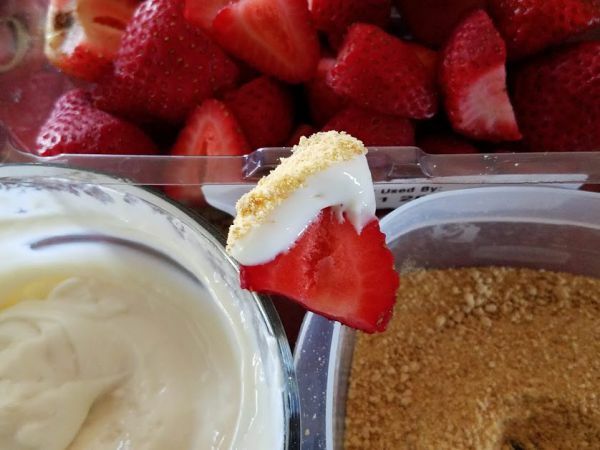 Didn’t stuff the strawberries with the cheesecake fluff but just dipped them into it and then into the graham cracker crumbs. Truly mouth-watering. Cheesecake without the guilt. Unless you eat your weight in the stuff. Hope you will check out some of my other #pinterestchallenge posts: April, May, June. And come back in August when I will be linking up with the gals again. Thanks, loves, for coming by. Let me know if you try this recipe, won’t you? And if you like it, you’d probably like my Mexican street corn, too. Bon appétit! I will absolutely be making this one…when no one is home but me, I’ll eat it in front of the television along with a whole bag of scoops. Perfect day! Thanks for sharing this one (and the strawberry cream cheese recipe). When I eventually land on TLC’s My 600 Pound Life, I will blame these recipes (and beer), And burgers (which we also love…but good ones…although I’d never turn down a basic Mickey D’s either). Yay, I knew that word would work! Cheesy is a prerequisite for most everything PC eats! This dip really is good. And you can call it a veggie and do away with all that guilt! We alternate between feeling bad ourselves and good about ourselves when we watch My 600 Pound Life. Ha! Even together we aren’t close to 600 pounds, thank goodness, but I can see where, given the right (or wrong) circumstances, I could easily eat my way/weigh to poor health. Right now I keep patting myself on my back (when I can reach it) saying I still weigh what I did two years ago, three years ago. But I am also shrinking!! So that same 144 doesn’t look the same on 5’4″ as it did spread over 5’6″. Dad gum! Yum this looks so delicious, pinning it my recipe board! great being in this fabulous challenge with you. Thank you, Maria. I really like the Pinterest challenges. Fun getting all of this inspiration and meeting new gals. Ditto, had me at cheesy too! Looks soooooo good. Can’t wait to try it! Debbee, hope you will try the cheesy corn dip. So easy to make and big and littles alike seem to love it Thank you for coming by. This looks so delicious and so perfect for the summer! I would have to use fresh corn, of course! I don’t know if I have a favorite summer dip. I love them all! Ooo, fresh corn would be even better in this recipe. Thanks for the suggestion! That sounds delicious! My favorite dip tends to be the warm spinach dip; yum! Pinned. Mmmm, spinach dip is scrumptious, too. 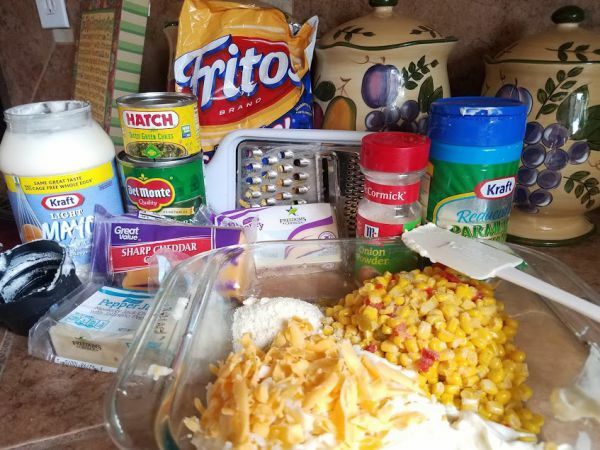 Hope you will give this cheesy corn dip a try. I think everyone will love it. I love Trisha Yearwood and her hubs, too. Hope you will try this cheesy corn dip recipe. I bet your whole gang will love it! Dips are great and the cheesier the better!! I have to try this one for our upcoming BBQ party with friends, I always try to make something new, I think this would be great!! Oh, Katrin, hope you will try this cheesy corn dip for your BBQ party. We were planning to have my hub’s ball team for BBQ and it was on my menu but the summer has gotten away from us and not sure now if we will have the party after all. Enjoy!! Thank you for coming by. Yum! Tasty, easy, and delicious! We love burgers in the summer and this makes a great side dish or appetizer! Thanks for sharing! Thank you, Laura. Hope you will try the corn dip. It is a sneaky way to get veggies into our non-veggie eaters…AKA PC. This seems like an easy food to make when you have friends over for movie night. Love it! Yay, movie night!! This cheesy corn dip would be great for movie night! Great suggestion. Thank you, Sheena. This dish looks fantastic. If I were still working I would be bringing this in for one of our many gatherings. I will certainly remember this recipe if I need to make a dip. Oh, my!! This looks so yummy and I know is going to be a huge hit in our house! Thank you so much for sharing. Aw, thanks, Sam. Hope your crew does like the corn dip. Sheena suggested fixing it for movie night. Great idea! The dish looks lo delicious, can’t wait to make it by my own. Thank you, Mary! 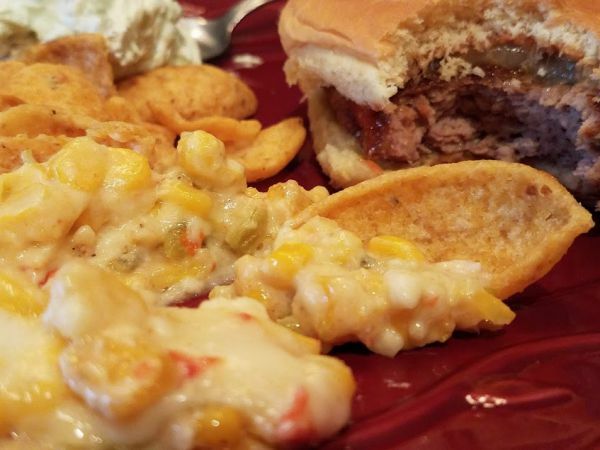 We love the cheesy corn dip. Hope you will give it a try. I’ve made a similar dip and it’s delicious! I agree the Mexicorn is a good choice for this. There’s also a brand of frozen veggies (Hanover if they sell it in your region) that has black beans, corn, onions and peppers. It makes a good substitute. I like it best with the Fritos scoops, yum! Wow, need to find those Hanover frozen veggies. They would be delicious in this recipe. Thank you for the suggestion. And maybe some French’s fried onions on top? Thank you for coming by Lydia! Omgosh, Wendy’s as fine dining is too funny. This dip recipe sounds so good. I love a good warm dip for chips. I wonder what this would taste like slathered on top of the burger? This looks scrumptious! It will be a great way to use up some stray cans of corn floating around in my pantry. Pinned! This looks like a great dip to take to work – we always have a back to school party! You know how teachers love to eat! Pinning! Now this looks like it would be a hit at my house! I follow recipes as well as you do too! It’s always more of a suggestion than a hard rule. I think this might make our list of game time dips. Thank you for sharing. Atta girl, recipes are just suggestions, I totally agree. I dump everything in and then wonder why things taste differently each time I make them!! Hope you will try these cheesy corn dip. It is really yum. Oh yum! Anything with fritos and cheese is a win to me! Sounds delicious! Me, too. My hubs is happy with just cheese but I need a little crunch with my cheese. Hope you will try this cheesy corn dip. It is delish. Cheesy dip sounds amazing! I was laughing at the “dining” so cute, everyone likes what they like.